Queen Elizabeth II has just reached an important milestone. She has been sitting on the throne for longer than her Great Grandmother Queen Victoria, who managed 63 years too, (but less days). In 2007 she and Prince Philip celebrated their Diamond Wedding Anniversary and Buckingham Palace released this charming photograph (below right) taken at Broadlands, in Hampshire, where they had previously posed for the engagement announcement. It is a great achievement to stay married to the same person for 60 years (68 now) too. This is a woman who is constant through and through. What is also interesting is that both of them are wearing similar outfits (apparently not deliberately planned). The Duke of Edinburgh has filled out a little, lost some hair, and is still somewhat awkward with a photographer. He wears a suit and tie, one button done up (correctly), a classic silk tie in a lighter shade, and pocket handkerchief. The Queen is also stouter than her younger self, but she has continued with a similar style. A high necked blouse, a buttoned jacket with set in sleeves and a face framing collar, and simple classic jewellry – studs in her ears, two strands of natural pearls and an oval brooch. Both jackets evidently tailored made; the fit is good. Even her hairstyle is similar – off the face, curled at the neckline and probably set and sprayed. 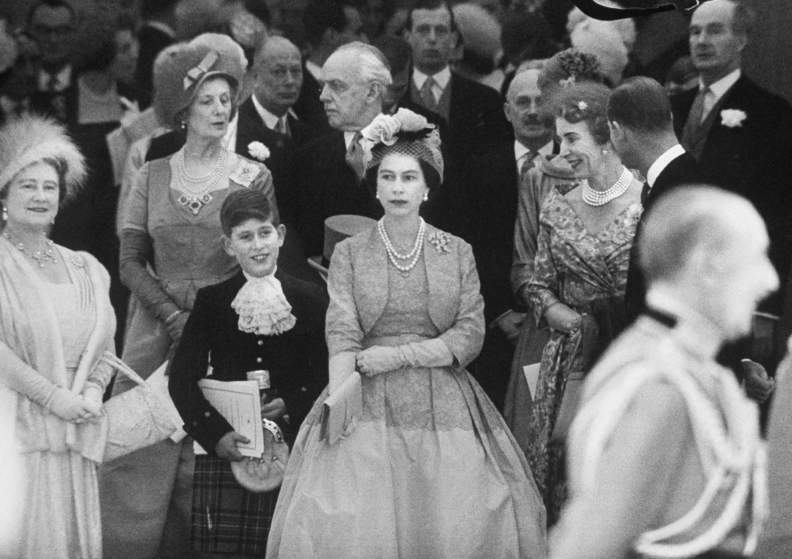 When Queen Elizabeth was youthful she wore some beautiful clothes. Here is a gorgeous image from 1954 in which she wears, I think, a dark silk dress with gathered skirt and yoke. The white shoes, gloves and bag worn with a sweet hat make this dress look smart and comfortable in the high heat. Here, at her sister’s wedding in 1960, she looks amazing in a tightly fitted full length dress with matching bolero and elbow length gloves. I love the hat especially. But of course it was rather an old fashioned look at the time. And here is one where she has adopted some of the 1960s styling. Maybe it’s that engagement brooch again, matched with a sapphire blue velvet pleated hat. I really like this silver dress with matching simple coat, worn with fashionable shoes. These days the Queen always wears black shoes and a black bag (I am guessing she has several identical pairs, and ditto with her bags). Maybe a bit dressy for watching the horses, but the public would expect the Queen to stand out in a crowd. I have decided to stop blogging everyday, so from next week I am going to skip Sundays. Day of Rest if you like. And maybe one day in the week. I’ll see how I go. What a lovely post! 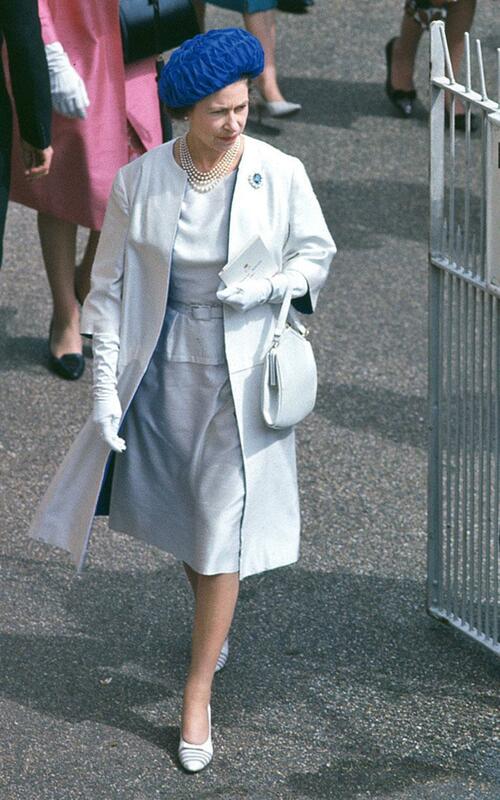 I think the Queen is a wonderful and very stylish lady. You’re right, in her younger days she was a beauty and wore some amazing outfits. Some of the Queen’s clothes were lovely. Obviously, she’s elderly (I’m not going to say old) now and it’s amazing that she still looks as good as she does – and that Philip does too. My mother is slightly younger and, like the Queen, has fabulous images of her younger self. She’s not in the public eye so now adopts a more casual approach but still has outfits which would appear a little too formal by modern views. I can’t imagine what it would be like blogging everyday! I have difficulty keeping up with posts! Cutting your blogging frequency seems like sense. Enjoy your extra free time. I can’t help it- I just love her! Thank you Lyn, that is such a touching remark. I greatly admire the Queen, like many people do of course. She is the constant one amongst a lot of hangers on and I hope she continues for many more years. I like her style – just right for a royal, although not very modern. I will miss your daily posts but quite understand. Quality over quantity is always best. A great lady and a source of great stability to the country. You have shared with us all some of your fashion and style knowledge, thank you. Enjoy the freedom to blog whenever your in the mood to write. Thanks Jane, I loved your post. And of course meeting you. Wasn’t that super? Not just to be able to stay married to the same man for 68 years, but to still smile at him with affection! (I barely made 4 years). I don’t know how you manage to blog daily, enjoy your day off! I’ve always thought the Queen was a beautiful woman and so pretty and fresh looking when she was younger. Thanks for sharing this. As far as the blogging, I never cease to be amazed at the quantity and frequency of your posts. I find them all interesting as you perspective, from across the pond, is not one I hear regularly. I appreciate all the blogging you do and heavens, take a well deserved rest! Lovely post! And good for you for taking back a day. It’ll just make Monday much more interesting! 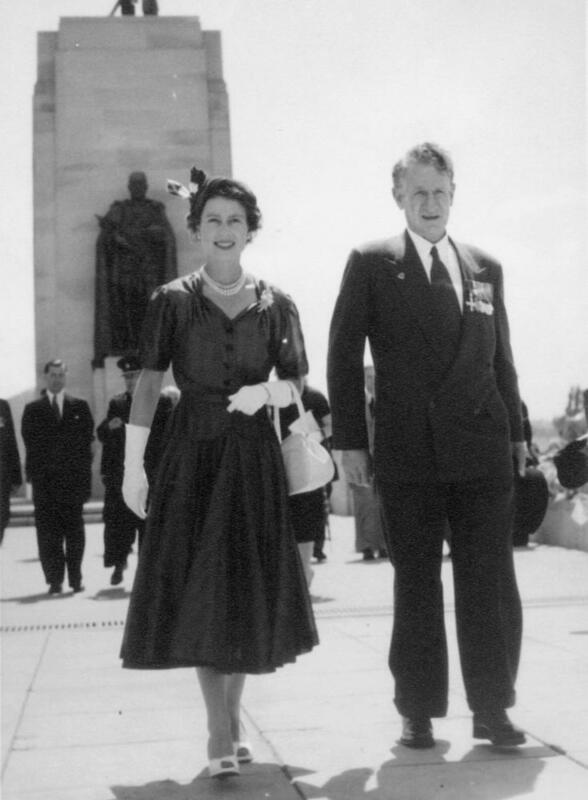 I have always had a soft spot for the Queen (and the Queen Mother). These are lovely photos. K., you are the one doing all of the research, so although I will miss your daily posts (so interesting! ), of course you should do what is optimal for you in terms of work and play. A lovely celebration of an inspirational lady by another. Enjoy your well deserved days off from blogging – we don’t deserve you every day! Thank you Kim for your very kind and supportive messages.